The Clearing is the only program in the United States offering serious treatment for mature, motivated people in comfortable, closed sessions of 10 participants at a time. We get it. Past challenges don’t have to determine your future. Our innovative, residential treatment program focuses on healing the underlying core issues, which fuel substance abuse, depression, anxiety and other challenges to our mental health. Participants join a small group for an uninterrupted and immersive curriculum-based program in our serene and secluded estate on San Juan Island in the Puget Sound of Washington State. Our 43-acre property is thoughtfully maintained with private rooms, chef-prepared meals and an attention to detail that allows you to comfortably heal. We are a licensed dual diagnosis inpatient residential treatment program in Washington State. "The Clearing separates itself from all the others with its small group format of no more than 10 participants for the entire month, private bedrooms and bathrooms, 6 days a week of structured emotional and cognitive work based on science as well as evidence based psychology work. The Clearing reveals a variety of methods, modalities and tools which comprehensively come together to re-frame the way you think, the way you view yourself and view the world. It does not infringe on your personal beliefs, nor does it concentrate on your "issue." It gets to the core emotional events, the root causes which have led you there. If you are struggling with addiction and or depression and anxiety as I was, you'll learn to resolve these issues for the last time. You no longer have to live with it. The Clearing will change your life--and your family's." Our graduates have had tremendous success. Over 80% of our graduates report being free of their addiction. What is a Non 12 Step Rehab? 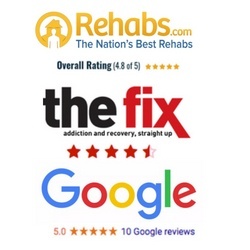 A non 12-Step rehab is just that, an alternative to traditional 12-Step addiction treatment. AA doesn’t work for everyone. If it doesn’t work for you, you have your reasons, and yours is the only opinion that truly matters. Your task is to be proactive and empowered in finding something that works for you. Underlying core issues represent the point in time when we began responding to experiences in unhealthy ways. We can see our physical, mental or emotional reactions feel out of proportion or unrelated to the event at hand. When traced to their origin, our feelings make sense and are easy to understand. This is the first step to being able to change. Every individual is unique and there’s no yardstick to measure a "traumatic" event. Trauma may be as subtle as a painful playground encounter or as horrific as the outer boundaries of assault, abuse or violation. But in the uniqueness that is you, some events on the scale may vastly impact your life. What if I’m Not Experiencing Substance Abuse? The absence of substance abuse has no impact on your experience of healing in this Program. A difficulty for people who are not challenged by substance abuse is "where can I go for healing?” Unfortunately, your options for treatment are often less structured; these may include relying heavily on medications, weekly counseling, and perhaps even mental hospitalization. Hospitalization is an option because, frankly, most addiction treatment programs would be very poor choices for your needs given their focus on substance abuse as the primary issue. In our remarkable and substantive Program, healing your issues will be in lock-step with our curriculum. We don't focus or address individual substances because we know that's not the problem. Regardless of the origin, our focus is entirely on the issues causing life to be out of balance. Substances are merely the coping mechanisms some have chosen to deal with 'underlying core issues.' In your particular experience, you may cope in other ways: isolation, self-loathing, feelings of hopelessness, excessive exercise, ignoring or powering through your feelings; the list goes on and on.
" This is a life course. “Life 101”. This info needs to be taught to all. If one truly wants to achieve any level of wholeness, health and self-actualization – this is the school. The Clearing is so, so much more than rehabilitation. I came for chronic depression and isolation and I’m leaving here firmly on a path I could only dream of before. I am forever changed and infinitely thankful. I never imaged a program could reach me when no self-help book, talk, retreat, loved one or even myself could. Each of the counselors so integral with specific skills and intuition. Not enough room to express my gratitude and awe at what has been created here. Thank You. " More than 30% of the adult population is currently experiencing a substance abuse issue which requires treatment. Over 50% of us will experience debilitating mental or emotional issues in our lifetime such as depression, anxiety, stress, isolation, social anxiety, low self esteem.